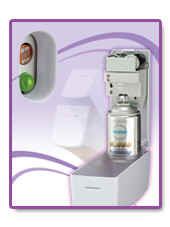 Day/Night Automatic light sensor air freshener dispenser. Simple setting at 5 minutes, 7.5 minutes or 15 minutes interval. Operates on 2 "D" Cell branded alkaline batteries that can last up to one year. Detachable mechanism allows easy replacement without dismantling the dispenser. Day/Night Auto-light sensor allow automatic shut off when room is dark without light or night. Operates on 1 or 2 D-cell alkaline batteries to activate the metered valve of the aerosol can. Spray interval can be programmed at 5 minutes, 7.5 minutes or 15 minutes simply by setting the timer control switch to your choice depending on the best desired results. Each aerosol canister contains a minimum 3,000 metered sprays and is normally effective for a space volume of 6,000 cubic feet. Set at 15 minutes interval on 24 hours a day, one canister will last 30 days or 60 days for 6,000 metered sprays can. Green blinking LED light indicates unit is in operation, and will change to red when batteries are weak.